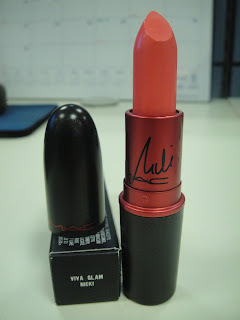 MAC Viva Glam Nicki Minaj Lipstick | Vanity and Everything in Between. I finally got my hands on MAC Viva Glam Nicki Minaj lipstick! 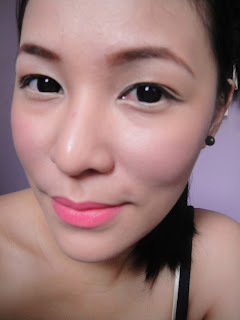 It's another limited edition from MAC and I knew I just gotta have it cos it's pink! When I first saw it, it instantly reminded me of MAC Watch Me Simmer. It's like they have the same opaqueness just by looking at the color from the tube. It gives you that weird feeling of what the shade really is. Looking at the color, I thought it would be louder than MAC Pink Nouveau and I hoped that it would be more wearable than MAC Lady Gaga. But when I finally used it, it wasn't as loud as I hoped it to be - which is a good thing. It's a good thing because it gives me he chance to wear if as often as I'd like to without getting stares left and right. I actually find more more wearable than MAC Pink Nouveau and MAC Love Me Forever. This lipstick is satin so expect exposure of lip lines after application. I probably won't buy another tube because I have way too many pink lipsticks. Although I gotta admit that lipstick is nice to have - especially if you don't have a lot of dark pink lipsticks on your makeup kit. that color is GORGEOUS! i don't think that I will buy it because i have many other lipsticks that i still need to use! @ Janet: yes, gorgeous shade indeed! Wearable too! I got this lipstick too and I just love the color so much! It's so vibrant and neon!!! !